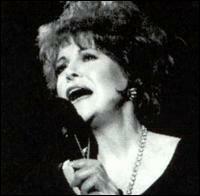 Born in 1930 in England, Annie Ross moved to the United States when she was three. She is one of the early practitioners of a singing style known as vocalese, which involves the setting of original lyrics to an instrumental jazz solo. Her 1952 treatment of saxophonist Wardell Gray's "Twisted," which became a huge hit, is the classic example of vocalese. Ross is probably known most widely by her participation in and contribution to the super vocalese group Lanbert, Hendricks and Ross which was formed in 1957. Her vocal technique and impeccable sense of swing amazed many jazz fans. She left the group in the 1960s, went to England to focus on her solo career. Her musical career was put on a back burner during the 1970s, but she released a come-back album in 1995.